A great way to enjoy all of the garden fresh summer vegetables. The grilled flavor enhances their flavor. You will want to make these kabobs whenever you have these vegetables to enjoy. Whisk together wine and next 6 ingredients until well blended; reserve 1/4 cup. Combine remaining white wine mixture and vegetables in a large bowl. Cover and chill at least 30 minutes or up to 2 hours. Preheat grill to 350° to 400° (medium-high). 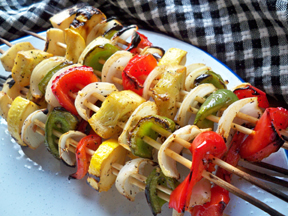 Thread vegetables onto skewers, and grill. Nutrition info varies depending on veggies. 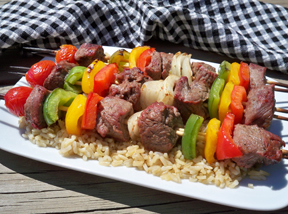 "These kabobs were so flavorful and easy to make. I made them and my husband grilled them. We will definitely be making these again."